We truly appreciate the support you can give us. 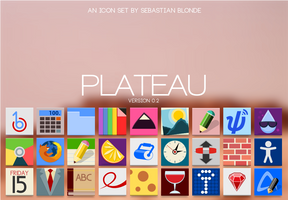 Lüv is the spiritual successor to Flattr, a flat but complex icon theme for freedesktop environments. Artwork is Licensed under the Creative Commons Attribution-Share Alike 4.0 License. Thanks!. I don't have any plans to port them to Windows. However, they're SVG files and can be edited and exported to PNG and then to ICO. You are welcome , i like your works . How exactly can I download and install this on Fedora 22? 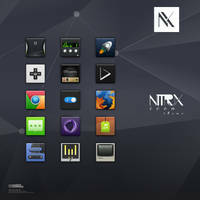 I tried downloading it from the Nitrux store, my details were taken bu ti wasn't given a download link. The zip download from GitHub doesn't have any icons! What exactly should I do? Help would appreciated. After you click "Place Order" you're given the link. It's right below the name and above the subtotal. The ZIP form Github contains files, I just downloaded it. Hi, congratulation for the fantastic icons. accessori - giochi - grafica - istruzione - sviluppo - ufficio (accessories-games-graphics-education-development-office). If the icons don't show up in your menus make sure the .desktop file points to the icon, e.g: Inside Python2.7 .desktop file locate the line Icon= and replace the value with "python" or "python2.7" (without the quotes). Thanks for your time and sorry for my english. Hi; thanks. Those icons are missing in Flattr, what the notes mean is that in the case of launchers that use hardcoded icon paths in them you will have to edit them to point tot he icon instead of the full path fo the image the application is using. Is there a color palette and style guide? That'd help folks contribute additional icons that fit nicely with the theme of your set. There was but I removed it. I have to make a new one. Love the new folders. the best icon theme, yes. Yes there are a lot of icons missing; thanks!. The new folders are just sick. Excellent work! What are those hardwareish icons for? Those in the preview are for virtualbox and hwinfo. First off gotta say that I love this set of icons. I am running in to one issue that I am not sure how to fix. I use a dark theme with Google Chrome, and the nav buttons are really hard to see. They are just barely lighter then the background of the topbar in chrome. That isn't an issue of the icons, the icons are for light themes, if you use them on a dark theme.. well that's going to happen. 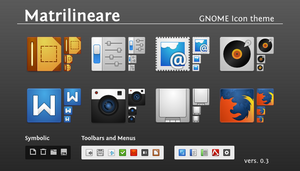 That and, Chrome doesn't use symbolic icons like the Gnome apps. Symbolic icons do change their color depending on the GTK theme. Is there any work around for this? Sure, everyone is free to submit icons to the theme on github, if someone submits a light variant there will be light icons. This is probably a very silly question but what should I edit to set the folder icon? I mean the general folder, not a specific one. Edit the SVG file? or change the colors?. I mean, all my non specific folders are not from the flattr theme, music, pictures and other named folders are flattr, but just general folders are not. What should I do to get them to work? This is what I mean. I'm sure it's just me being inexperienced but do you think you can fill my lack of knowledge on the field? 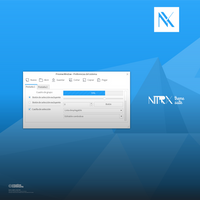 Did you mix the theme with another?, I installed Thunar in a Linux Mint VM and the folder is from Flattr. The icons in the sidebar of Thunar are also from Flattr except for those that are indeed missing. Nope, I just extracted the downloaded file in the .icons folder as usual, I don't understand why it's doing like that. I can follow your problem better if you raise an issue at the GitHub repo. I didn't realize it was an actual problem, I thought your icon theme was customizeable and there was something to edit to pick which folder icon to make default. I never used GitHub before but I'll make an account there right after lunch and raise an issue there, thanks for your time! You're the first user to have this issue (or to report it). 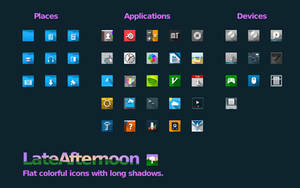 The icon theme allows you to change the color of the folder(s) and the color of its symbol(s). Whether you can choose a different icon for a specific folder it's a feature of the desktop environment you're using and the file manager you're using. Thunar doesn't allow you to do it, Nautilus does for example. I LOVE this icon set, it's perfect. It's exactly what I've been looking for and I never even knew it. I can't wait for more of these, they're so pretty it makes me want to download more apps lol. will there ever be a flattr set supporting dark themes? Whenever someone contributes to the icons with a light variant, yes. Looks great! I wish there was some sort of PPA for it which automatically gets updated with new icons which you upload or someone else does. Updates for the theme are just 1 command away, also, it isn't complete to be distributed in our PPAs. Thanks a lot for these magnificient icons, I love 'em! I used The Firefox Icon In My Upcoming Icon Theme "Brooklyn"
I'd love to see them on a phone!